April 2017 issue on sale now! | What Hi-Fi? April 2017 issue on sale now! 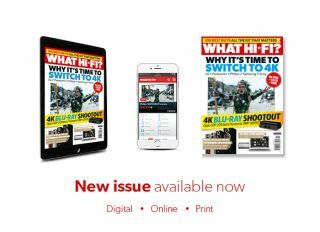 With 4K TVs, 4K Blu-ray players, HLG images, turntables, speakers and soundbars all reviewed, the latest edition of What Hi-Fi? will ensure you're no April Fool when buying your hi-fi or home cinema kit. Spring has almost sprung; and as nature breathes new life into flora and fauna, you should take the opportunity to do the same to your hi-fi and home cinema kit - guided, of course, by the April issue of What Hi-Fi? 4K is the future, and was a focus for Samsung, Sony, Philips, Panasonic and LG at CES 2017. This year's flagship televisions are all taking advantage of the pixel-packed technology, and if you want to stay ahead of the game when these products hit the stores, then our in-depth investigation is required reading. But there's no point having a 4K television without the means to play high-quality content, and that's why we set up Oppo and Panasonic to face off with their respective five-star Blu-ray players. It's a close fight; both products are at the high end of the price range, but vary slightly in the video they can play. The Oppo is a heftier device, with two more USB inputs than the Panasonic and a better audio resolution to boot. However, the Panasonic has smart functionality to stream content from BBC iPlayer, Netflix and Amazon Video. They're both five-star performers, but which will come out on top? Just when you'd got your head around UHD and HDR, there's another technology to get to grips with. This time it's Hybrid Log Gamma (HLG), the product of joint research by the BBC and Japan's national broadcaster NHK. HLG's selling point is that it can combine SDR and HDR images into one digital signal, which is decoded on your television. Making HDR a more convenient solution for the broadcast world is a difficult feat, but HLG seems to be the best bet. Pushing the limits of both your bank balance and your sound system this month is a £14,500 integrated amplifier from Audio Research. Hi-fi purists may frown upon the concept of integration, but in this instance the quality you get, without the quantity of kit, warrants the five-star verdict. We also celebrate 70 years of Sony, which is highlighting the landmark with a range of Signature products, including a £1700 pair of headphones. Designed to showcase the company's expertise, these are possibly the finest closed-back headphones we've heard. If you're a fan of space-saving solutions but haven't yet considered powered speakers, then you're missing a trick. Powered speakers have built-in amplification, reduce cable clutter and take the hassle out of system matching. However, with the greater convenience usually comes greater competition, and the likes of Audioengine, Audio Pro, Dali, Dynaudio, Triangle and Wharfedale are all fighting it out to be the brand in your sound system. For those that like their products with real power, we take a look at some of the newest floorstanders and standmounts priced between £600 and £1000. We all want the best quality audio possible, and with more of us listening to music on our mobile phones, streaming services are no exception. Spotify has announced it will offer a lossless streaming tier, while Tidal's Masters service promises MQA-encoded music that can deliver hi-res audio. But just how good is Tidal's offering, and does it live up to its hype? The short answer is 'yes' - Tidal Masters could be a best-of-both worlds solution between sound quality and convenience. And if that's not enough, we have a hefty array of First Tests this month.